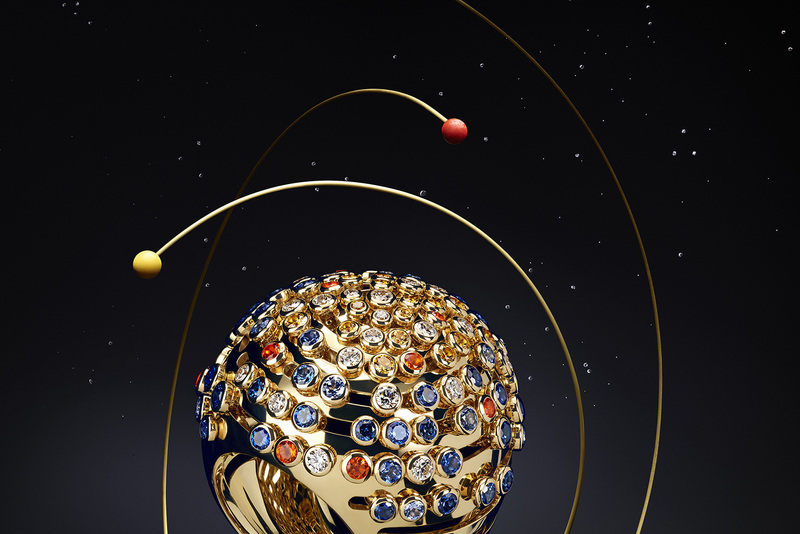 Traverse the cosmos with this new creation from Cartier Jewelry! 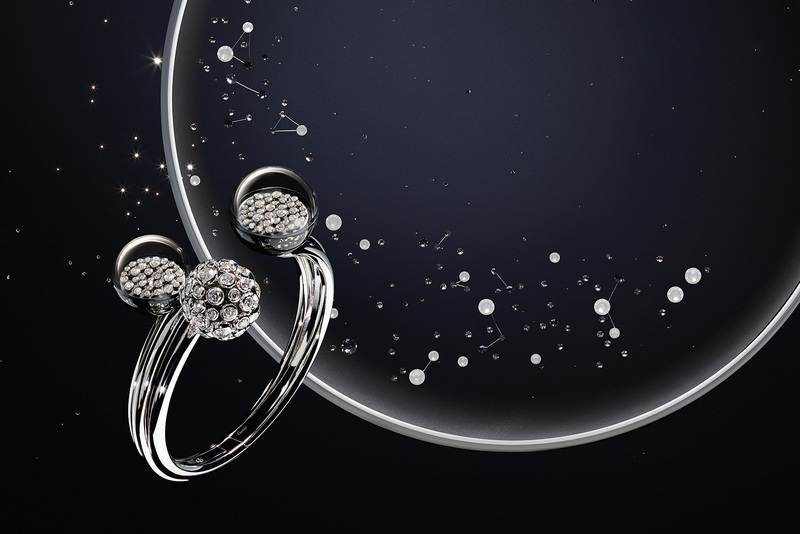 Cartier Jewelry open the cosmic portal to a new dimension of jewel making with this design. Imagine the night sky. You see an endless stream of stars. All bestowing their individual magnificence upon us. Now imagine the planets in the solar system, all lined up and moving along a single cosmic path. Finally, imagine seeing Earth from the space. An endless stream of rays will fill your visual field while you witness countless mesmerizing stars on the surface. That’s exactly what the people at Cartier jewelry imagined and sought to create. What’s exactly did they make? In their new numbered limited edition collection ‘Les Galaxies de Cartier’ they have certainly captured the essence of the cosmic. By venturing down a road not taken by others they have finally transcended into the field of art. Hence, these masterpieces by Cartier jewelry capture your imagination and give it wings. This work is both tactile and sensoral. Cartier Jewelry announcement featuring Amy Adams wearing their Fractal Meteor design in the Golden Globe. 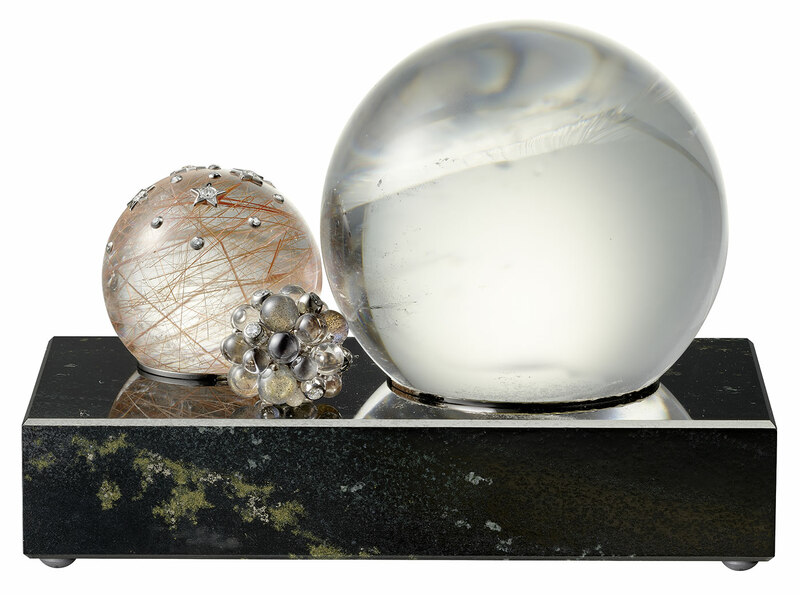 Each of the pieces is named after the specific cosmic entity or phenomena they were inspired from. Every piece from this Cartier jewelry collection is detailed below. 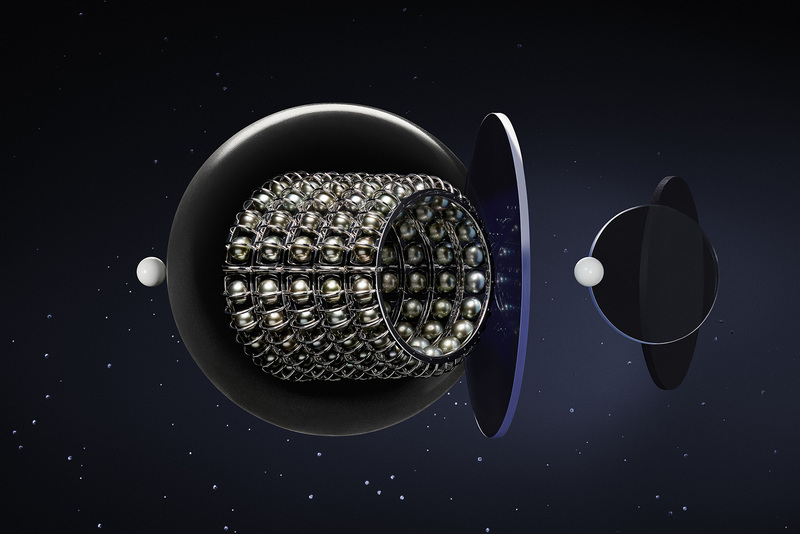 Cartier Jewelry ‘The Alignment of the Planets’ cuff from the ‘Les Galaxies de Cartier’ collection with Tahitian pearls in 18k white gold. It is inspired by the rare phenomenon in which the Sun, Moon, Mercury, Venus, Jupiter, and Saturn line up in a row. As a result, this bracelet has a unique appearance. 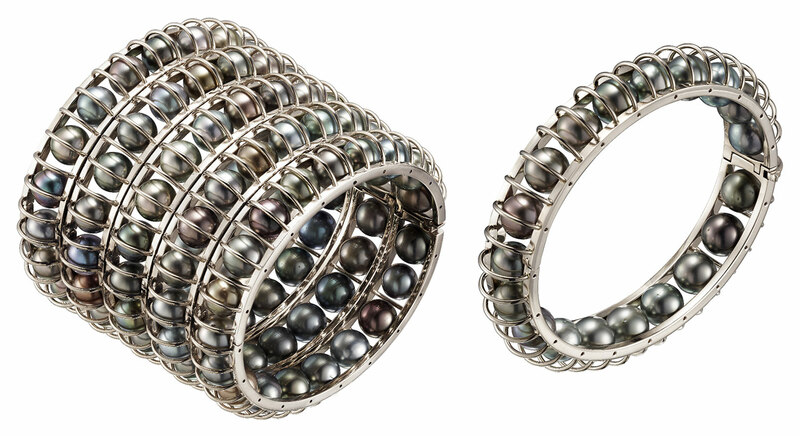 Cartier jewelry decided that the white gold ‘cage’ was especially fitting for the pearls. These Tahitian pearls of greenish-bronze and peacock feather colors look stunning above all. Coupled with white gold, they are reminiscent of the unsolved mysteries of the Universe. Cartier Jewelry ‘The Alignment of the Planets’ bracelet from the ‘Les Galaxies de Cartier’ collection with Tahitian pearls in 18k white gold. The geometric design likewise reminds one of the mathematical nature of this incredible phenomenon. The pearls roll one after the other. As a result, one can feel the movement of these celestial orbs as they move across the skin. 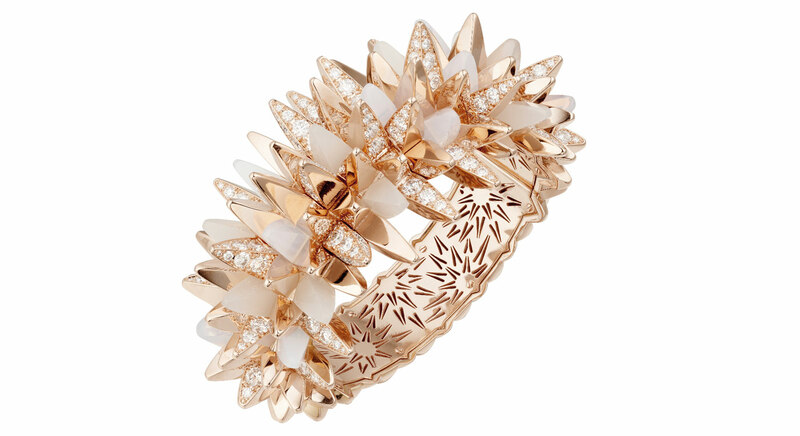 Cartier Jewelry ‘Fractal Meteor’ bracelet from ‘Les Galaxies de Cartier’ collection with diamonds, moonstone and milky quartz in 18k rose gold. 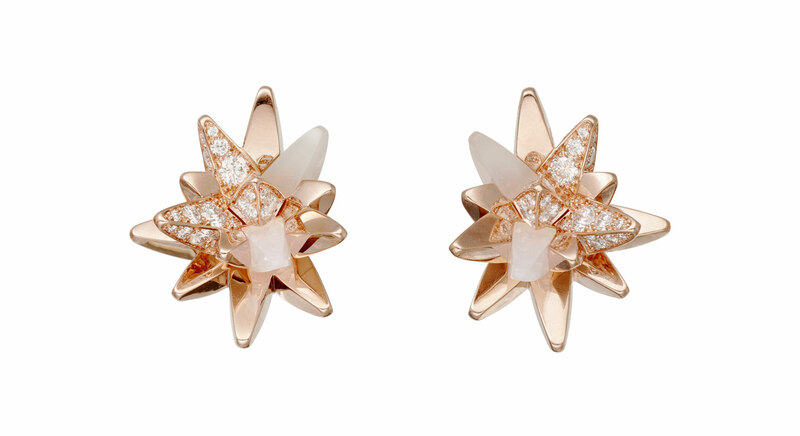 Cartier Jewelry ‘Fractal Meteor’ earrings from ‘Les Galaxies de Cartier’ collection with diamonds, moonstone and milky quartz in 18k rose gold. Reminiscent of eon-old meteorites and asteroids, this piece by Cartier jewelry is breathtaking. The edges and protrusions form a complex crystal structure. Furthermore, they are carved out of precious pyramids of pink gold, diamonds, moonstone, and milky quartz. This collection features a ring, bracelet, earrings, pendant, and clutch. 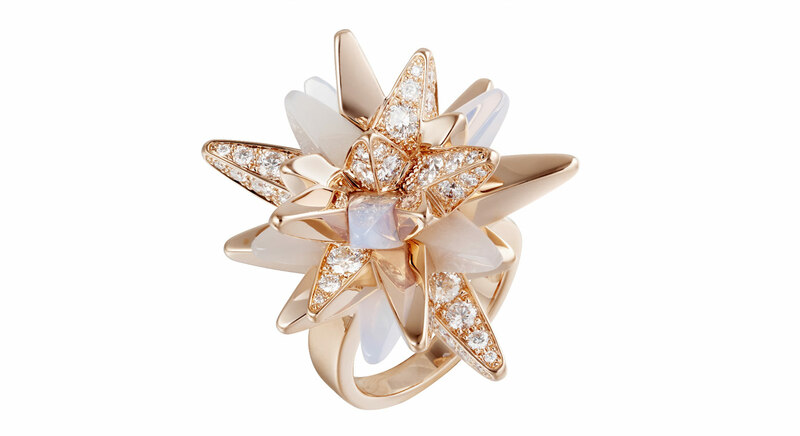 Cartier Jewelry ‘Fractal Meteor’ ring from ‘Les Galaxies de Cartier’ collection with diamonds, moonstone and milky quartz in 18k rose gold. 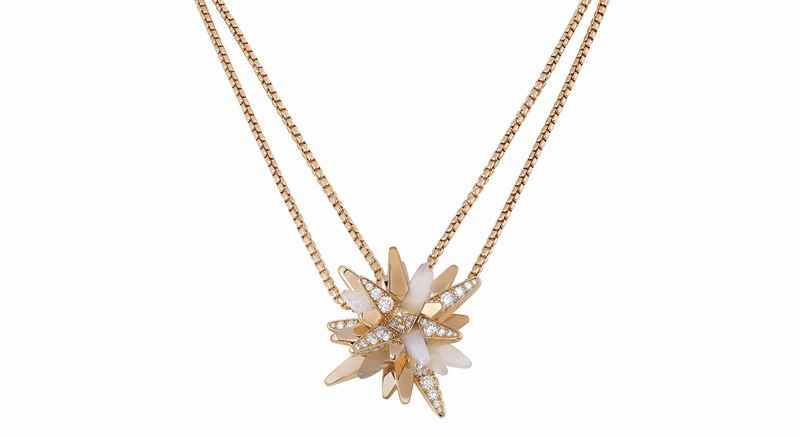 Cartier Jewelry ‘Fractal Meteor’ pendant from ‘Les Galaxies de Cartier’ collection with diamonds, moonstone and milky quartz in 18k rose gold. 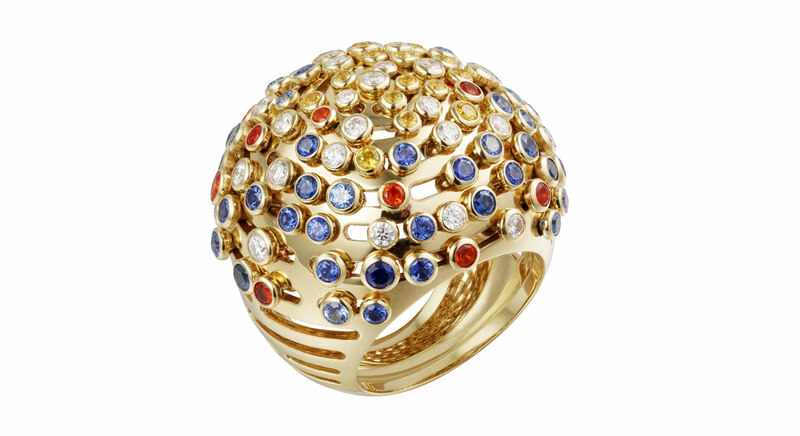 Cartier Jewelry ‘Lights of the Earth’ bombe ring from the ‘Les Galaxies de Cartier’ collection with yellow and blue sapphires, fire opals and diamonds in 18k yellow gold. Yellow sapphires, fire opals, and diamonds create the illusion of the Earth viewed from space. They certainly look like millions of red, yellow and blue lights coming together to perform a mesmerizing show. Cartier Jewelry ‘Lights of the Earth’ ring from the ‘Les Galaxies de Cartier’ collection with yellow and blue sapphires, fire opals and diamonds in 18k yellow gold. Furthermore, the gemstones are free to move along rails of yellow gold and shine like an endless array of illuminations. A ring, a bracelet, and a large pendant are part of this Cartier jewelry set. 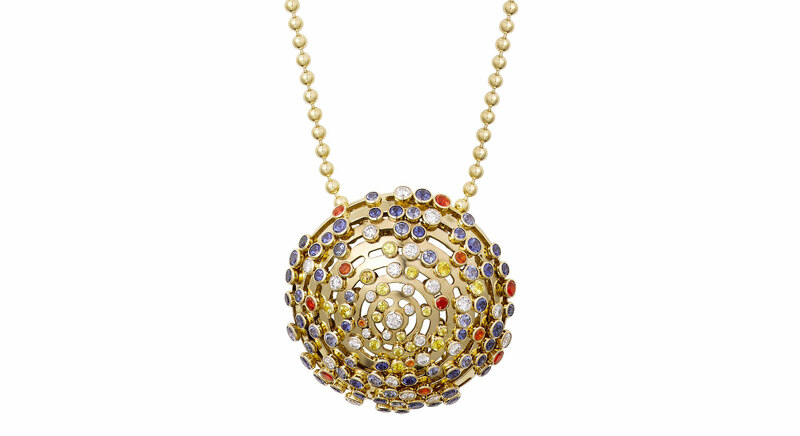 Cartier Jewelry ‘Lights of the Earth’ pendant necklace from the ‘Les Galaxies de Cartier’ collection with yellow and blue sapphires, fire opals and diamonds in 18k yellow gold. 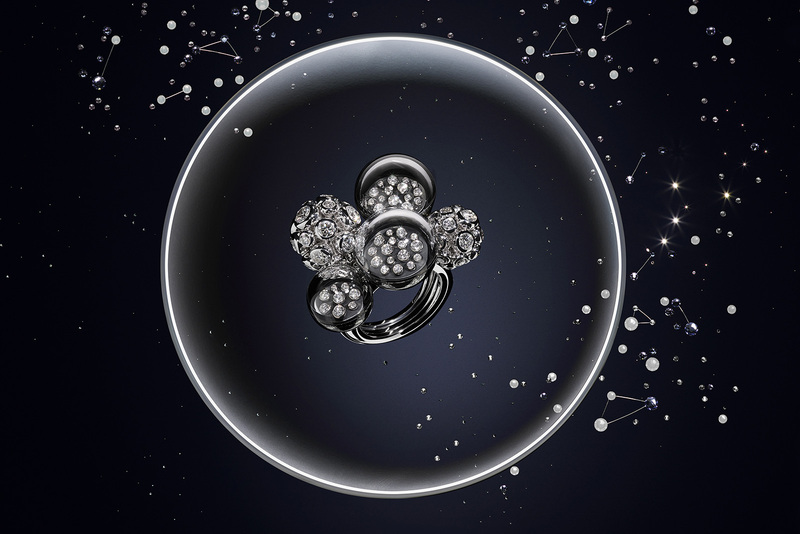 Cartier Jewelry ‘The Vibration of the Stars’ ring from the ‘Les Galaxies de Cartier’ collection with diamonds in Cartier’s serti vibrant 18k white gold setting. 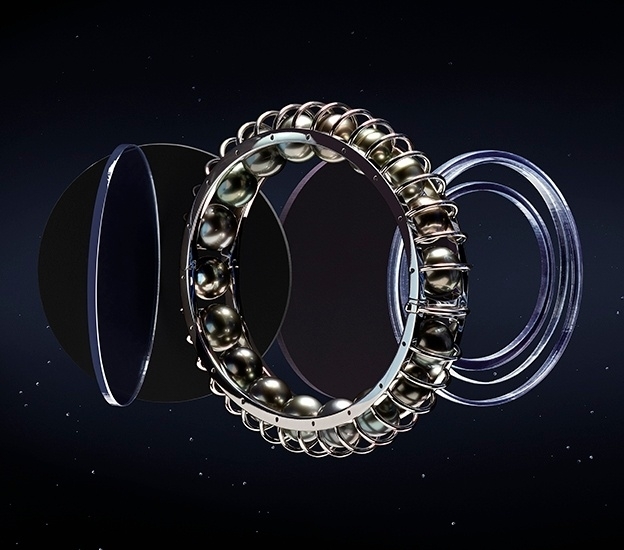 This galactic Cartier jewelry reproduces the wonders of the galaxy, the solar system, and especially the black holes. Diamonds represent the shining stars as each one shimmers brilliantly due to their Serti Vibrant setting. A hollow dome completely encapsulates the diamonds which are fitted on a meta-quartzite base. The base is enriched with golden pyrite. It provides more depth to the piece as a result. Cartier Jewelry’s ‘Trembling Stars’ table clock from ‘Les Galaxies de Cartier’ collection with diamonds, rock crystal, rutilated quartz, metaquartzite and pyrite inclusions. While this piece is metaphorically priceless, there is no word out on the actual pricing yet. Fret not though! It is definitely going to cost you more than an arm and a leg. But that’s the price you pay for excellence and therefore that is what enriches its value. Lastly, did you know that their mascot is a panther!? God makes, and apparel shapes: but ’tis money that finishes the man.